GRAFENWOEHR, Germany — Leadership with U.S. Army Garrison Bavaria and 7th Army Training Command host town halls to address concerns regarding lead on-post and at Army housing. Garmisch Peter Burke Center: Fri, Sept. 7, 8 a.m.
Tower Barracks Theater: Tue, Sept. 18, 6 p.m.
Rose Barracks Memorial Fitness Center: Tue, Sept. 25, 6 p.m.
Hohenfels Theater: Tue, Oct. 2, 1:30 p.m.
An article posted by Reuters Aug. 16 noted the incidence of elevated blood lead levels in children and the serious health effects related to lead exposures from living in Army housing. While lead is not a systemic problem at USAG Bavaria, some families stateside have expressed concerns about potential risks in government housing. 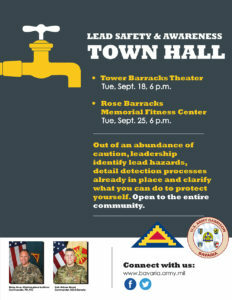 Join the 7ATC and USAG Bavaria leadership to address concerns about lead paint and lead in water at Army housing. Out of an abundance of caution, leadership intend to identify lead hazards, detail detection processes already in place and clarify what you can do to protect yourself.